Everyone of us use this understatement ‘WHY DOES GOD NEVER ANSWER MY PRAYERS?’ many times in our lifetime and many who been believers have become atheists because of the same. I personally thought the same many times when I really wanted a breakthrough in my life. It was the other day some thought occurred in my mind where it all made sense to me and want to share with you. It is said in the Gospel of Mathew- “Ask and it will be given to you; seek and you will find; knock and the door will be opened to you. For everyone who asks receives; the one who seeks finds; and to the one who knocks, the door will be opened. (‭Matthew‬ ‭7‬:‭7-8‬ NIV). Then why do some of our prayers not get answered? Some say a prayer has 3 answers. Sometimes it’s yes, no and wait, of course, that’s the only 3 ways a prayer could be answered but I think a better answer lies in the next verses of the above passage. “Which of you, if your son asks for bread, will give him a stone? Or if he asks for a fish, will give him a snake? If you, then, though you are evil, know how to give good gifts to your children, how much more will your Father in heaven give good gifts to those who ask him!” (‭Matthew‬ ‭7‬:‭9-11‬ NIV). The same passage is mentioned in Luke chapter 11. “Which of you fathers, if your son asks for a fish, will give him a snake instead? Or if he asks for an egg, will give him a scorpion? If you then, though you are evil, know how to give good gifts to your children, how much more will your Father in heaven give the Holy Spirit to those who ask him!” (‭Luke‬ ‭11‬:‭11-13‬ NIV). I am sure most of you have read this passage many times before and as plainly as it is written we understand if we the sinners and evil ones care for our children this much how much more does our Father in heaven loves and takes care for us. Then why do our prayers go unanswered? Consider the scenario where you take care of a baby. The baby is on your shoulder and you are carrying the baby on your shoulders and walking in the house. Suddenly the baby spots a bottle of glue or any other harmful substance sitting on the corner of a desk. Baby starts crying to get that bottle. Will you give that bottle to the baby? Of course not! Why? Because you know the baby doesn’t know what glue is or it can harm him/ her. So you try to get the baby’s attention to something else, but the baby starts crying. What will do you do now? No matter how much ever the baby cries you not giving the bottle to the baby. Why? Because you love the baby and knows if you give him/her that bottle the baby can swallow it and can cause some serious trouble. The baby might be hungry and in his/ her mind, it’s a bottle of food, but we know it’s not a food but can cause serious problems if ingested. So we never give the baby that bottle. Hold that thought. Now put ourselves in the place of that baby and God as the one who takes care of us. We might be in need of a job, car, house or anything so desperately and then you suddenly spot a similar opening at some place and you start praying to God asking to give you that opportunity. But you have no idea like the baby it is a bottle of glue or some other poison which can harm you and you keep on crying to see a breakthrough and nothing happens. Why? As said your Father in Heaven who takes care of you knows exactly what it is rather than how much you are desperate for it. He won’t give you anything that can harm you or take you away from his plans. He will give you only with the very best. Sometimes we are hungry and we are asking for food we see it as bread, whereas it is actually a stone or we ask for fish, but it actually is a snake or we ask for egg but it actually is a scorpion! Imagine what will happen if we were given any of the above choices? A stone doesn’t help you for bread, but the snake and the scorpion can harm and kill you. This is how exactly we see opportunities. As soon as we see an opportunity we aim for it and starts praying. Sometimes it’s a stone, but at times it can be a snake or a scorpion which can bring the end to your life. So when you see your prayers are not answered even when you think it is the most needed time, understand it might not be the same results as how you sees it. God is a good God and gives only the best for you. Jeremiah 29:11 says “For I know the plans I have for you,” declares the Lord, “plans to prosper you and not to harm you, plans to give you hope and a future.” (‭Jeremiah‬ ‭29‬:‭11‬ NIV). Where we see no hope for our future the one who created you knows exactly the plans he made you for and will bring out the very best for you. So no matter what trust God even when all prayer seems unanswered for surely there is an answer coming coming soon. True, we have plans for our lives, but God has greater and better plans for us. His thoughts and plans are as high as the sky to the earth. We think at earth level and our plans are such small ones, but the one who created you have such high plans that are as high as the skies! He will never leave you alone, nor will He give up on you. Like a rain comes to a drought, land and quenches its thirst God will send his words to quench every thirst of your life. So am I saying don’t pursue opportunities? Absolutely not. Pray for it and apply for it. But instead of praying God, I want this opportunity, pray God I would really like to have this opportunity, please give it only if your plans for my life fulfills through it. There is definitely a great hope and future for you, so no matter what you go through hang in there, keep on praying for there is a reward and your hope will not be cut off. Remember Joseph’s life. He was in jail for no reason. When he explained the dream to the wine master he thought it could help him to get out of the jail. But the wine aster forgot Joseph. But when the time came God made the Pharaoh to have a dream and made the wine master to remember Joseph and get him out of the jail to become the prime minister in Egypt! If the wine master had remembered Joseph earlier when he got out of jail, Joseph might have got out of the prison, but he never would have become the Prime Minister of Egypt. God has great plans for you. So when all your prayers go unanswered, trust God more and don’t lose hope for surely there is a reward and your hope will never be cut off. Powerful post!! Keep letting God use you! Thanks for the kind words. May God bless you! You’re welcome. Thanks for stopping by 🙂 God bless! I pray our LORD gives you grace, mercy and peace my brother. I am going to respectfully disagree with your premise that Christians have unanswered prayers. As God’s children we can have the confidence to know that when we go to our Father in prayer He does hear us and will answer us. 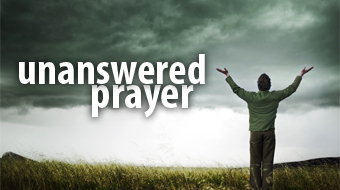 For the Christian there is no such thing as an unanswered prayer. Instead, as children of God we understand that not all answers are known to us right away but all prayers are answered immediately. It is the action of those answers that may take some time. We don’t get what we desire because we don’t ask or we ask with wrong motives. Dear sir, I didn’t say God doesn’t hear or answer our prayers, but as you see in the article, we may not get the answer as we expect at the time we anticipate we need the answer and makes us think ‘why God’s not answering my prayer when I need the most?’ But the fact is even before asking God knows exactly our needs and He’s already provided a provision, but it feels like to us as if it takes a little longer to receive it, but the fact is God provides everything in perfect time whether you expect it or not! Not a minute early or late! “There is definitely a great hope and future for you, so no matter what you go through hang in there, keep on praying for there is a reward and your hope will not be cut off”. Sometimes God’s answer doesn’t look like what we expected. Sometimes His answer is “wait”. Sometimes we are simply praying outside His will or His Word. Sometimes we aren’t listening or do not want to hear His answer….God does answer. I would also say to anyone who says, “God NEVER answers”…..NEVER? Not once? “never” is a strong word. We must start praying grown up prayers. Prayers modeled out of the Word of God or coming directly from the Word of God. God is NOT Santa or a genie. He could be but He is much more concerned with our character than He is with our comfort…. Surely God has got a great Hope and Future for everyone and His plans and thoughts are far higher than ours and He thinks and values us more than what we can ever think off and more importantly His plans are not to harm or hurt us, but for a bright and better future! Anyway thanks for sharing your view and for the encouragement. God Bless! You’re absolutely right and yeah as you you can see it’s the same concept u tried portrait in the article. It’s not our wishes or dreams but His plans and purposes in our life! God bless! I am sure our prayers are answered if so justified to God, only that we dnt realise, we are not sooo keen on it, sometyms it may take longer and answered moment when we have given up, or may not be answered, only God knows why!! It can be a contradiction with the scripture… Ask and will be given to you. Dear sir! I’m very sure God hears our prayers and answers them. And that’s exactly what I said in the article. Truly appreciate your comments and yes, you’re absolutely right. The answer to “only God knows why! !” is the article all about!